Finding ways for autistic children get outdoors and experience the world is rapidly becoming a common practice throughout Vietnam. In Hanoi, however, these children are not just brought outside for fresh air; instead they are exposed to social situations through something a bit more “alternative”: circus performances. Despite problems with handling emotional and social situations, these fearless teens are overcoming obstacles to leave a mark on society. Nguyen Khoi Nguyen, 16, is a prime example of the strength these youngsters can show. 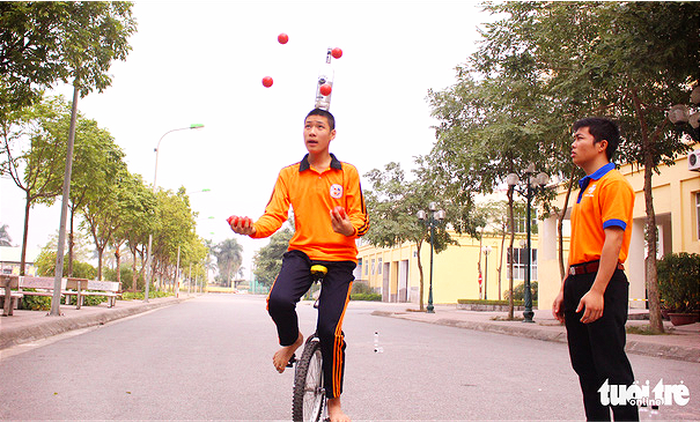 In May, 2017 the Hanoi teenager was recognized by the Vietnam Records Organization – Vietkings for his ability to hold a bottle on his head while riding a unicycle and juggling eight balls for a longer period of time than any other Vietnamese who has tried the feat. The idea of using circus stunts as a treatment for autistic children came from Phan Quoc Viet, co-founder of the Tam Viet Center in Hanoi, a clinic serving 26 autistic patients. Many of these autistic youngsters have problems controlling their own emotions, resulting in sudden screams, self-harm, or even harming others. Some of them even suffer from cerebral palsy and are unable to control their bodies. Khoi Nguyen is a part of this community. Instead of attempting to simply calm the children down, teachers at Tam Viet try to teach patients circus stunts in order to increase their ability to focus and develop their patience. The excitement spread across the children’s faces while they are focusing on joggling, holding bottles on their heads, standing still on rollers, or riding unicycles is nearly contagious throughout the center. Melodic tunes playing in the background contribute to the uplifting spirit running rampant in the building. Viet ensures that everyone at the center holds “patience” as a key virtue while working with patients with special needs. Though they often lack concentration, he says, the circus exercises are a key contributor in keeping them focused. Juggling is used to help patients learn to fully control their hands, while balancing on a roller can enhance focus, calmness, spinal flexibility, and leg activity. Unicycling can contribute to the teens’ adroitness and concentration. Viet founded the Tam Viet Center five years ago after years of researching the ineffectiveness of medicines used to treat autism and how conventional treatments were inhibiting autistic children from blending in with society. As a result, he began experimenting with circus stunts. Despite using these tricks as a primary treatment method, most teachers at Tam Viet are not trained in these activities. Instead, they have taught themselves several stunts in order to better serve their patients. The result: dozens of autistic teens with an improved ability to fit into the community and a clinic considered by many as a second home. Autistic performer Khoi Nguyen could not hide his happiness after performing onstage. “I get to do circus performances and stand onstage. Seeing others applaud makes me very proud. I also get to spend the money I make from the performances,” says the innocent 16-year-old. Khoi Nguyen’s achievements became just one of the inspirational stories proving the effectiveness of the new method and illustrating the value of efforts made by both family and teachers at the center. The story also gives hope to many families with autistic children. One of the teachers, Nguyen Thi Thuy Nga, told Tuoi Tre (Youth) that before Nguyen became an inspirational model for autistic patients, he would run around, stealing food and toys from others at the clinic. “After many years here, Nguyen can now interact with others. He knows how to respect teachers, help out around the place, carry dishes, prepare tables for meals, and help others practice. It is a miracle for an autistic patient to be able to help others practice juggling,” Nga said. Nguyen is not the center’s only success story. Minh, another patient, can now tell the zodiac sign associated with each birth year and has developed an excellent signing voice. Meanwhile, An has developed enough social confidence to look at people during interactions and speak with others. Hung used to refuse to eat meals, often screaming and assaulting teachers when forced to eat. After three weeks of practice, the patient was able to properly finish a meal and speak clearly. “The most difficult thing is to keep them patient. Sometimes there needs to be someone to keep the studying non-stop. When the patients successfully integrate, become record-holders in circus stunts, and are accepted by the society, they come back to help other patients,” shared Viet of his vision for the new treating method. “If Nguyen could do it, I [other patients] can do it as well and am going to do it better,” the co-founder said with determination.